Reilly Smith had all three RedHawks goals on the night, and the Miami defense stood tall in handing #8 Western Michigan it’s 8th loss of the season. Senior goaltender Connor Knapp took the ice again after a much criticized benching against Lake Superior State last weekend. Proving to be the wise choice tonight, Knapp stopped all but 1 of the 27 Bronco shots, bringing his personal unbeaten streak to 5 games. With yet another stellar performance in net, you’d think Knapp would take home the Perani Cup #1 Star of the Game. However, that honor goes to Captain Reilly Smith. Starting the scoring before the first media timeout, Smith scored the opening goal from Freshmen Austin Czarnik and Jimmy Mullin. Smith would go on to score the game winner in the second on a shorthanded chance, and a final goal in the third for his 3rd career hat trick. Reilly has 17 goals on the season, along with 7 assists and leads the team with 24 total points. It isn’t the scoring outbreak that we saw in 2010-11 from Andy Miele, but he is on his well on his way to reaching his 28 goals from last season. On the night, Czarnik had assists on all 3 goals, and Mullin had assists on the bookend goals. It was quite a night for the RedHawks top line who were a combined +8 on the night with all three goals and all 5 assists handed out. Reilly’s second period, shorthanded goal was also the game winner. That’s his 6th of the season, tying him for the national lead once again. Outside of the top line, the defense also looked fantastic as the ‘Hawks returned to Oxford for the first time since December 10th. Chris Wideman was a stellar +2 on the night, and the rest of the defense will go down tonight as being the unsung heroes. In the Miami zone, 19 Western Michigan shots were blocked, and there were countless hits from Miami defenders who were by far the more physical team behind the Miami net all night long. The RedHawks faithful was treated to a fantastic showing on every inch of the ice, and were very vocal in cheering on the Red and White. Smith’s third goal was some much needed insurance as well. Miami hadn’t played in Oxford since December 10th and hadn’t won in Oxford in over 2 months. The last Miami win in Oxford was a 4-0 win over BGSU on November 18th. In that span, they had lost an overtime heartbreaker to Ohio State 3-2, and lost in a shootout to BGSU after losing 4 one-goal leads on November 19th. Be sure to watch the rematch tomorrow night as Miami takes on these same Western Michigan Broncos at. Tomorrow night’s game will be broadcast across the great state of Ohio on the Ohio News Network (ONN) and puck drop is set for 7:05 PM. Don’t forget to follow us on Twitter (@RedskinWarriors) and take a look at our Saturday #SixPack in the morning for some eye-opening statistics from the Friday Night College Hockey landscape. – Two of Western Michigans’ three leading scorers, Shane Berschbach and Dane Walters did not play. At one point, Berschbach was a Miami commit before his scholarship offer was revoked due to off-ice issues prior to enrolling at Miami. We understand Walters is injured but do not know why Berschbach did not suit up for the Broncos. Something to watch for in the series finale. Contrary to popular belief, Miami’s head coach was NOT one of over 175 million twitter users when someone was posing as him near the end of last season. As of yesterday however, that story has changed, and the short-in-stature, tall-in-influence leader of the RedHawks has officially joined the Twitter ranks. Over 900 RedHawks and college hockey fans alike had already followed Da Coach on his first day on twitter, likely in thanks to ESPN Sportscenter anchor John Buccigross’ (@Buccigross) shout out. Now over 1,000 followers, Blasi didn’t waste any time catching up with old friends. Blasi is sure to provide great insights to the season as well as a good amount of comedic relief along the way. Follow @CoachBlasi now by heading over to twitter.com/coachblasi. You can also follow Redskin Warriors at twitter.com/redskinwarriors, or by clicking the Twitter link in the top right corner of the blog. I’ve even got all of the current RedHawks and a few of the older ones in this list. >Detroit, Mich. – Well, my predictions were actually pretty good…for once. CCHA Player of the Year Andy Miele had 2 goals and 2 assists and Hobey Baker finalist Carter Camper had 2 goals and 1 assist as the Miami RedHawks defeated Notre Dame 6-2. If not for two fluke goals, Cody Reichard may have registered another shutout. As it was, Reichard was solid as Miami extended its unbeaten streak to a school best 12 games. Both Camper and Miele were at their best as both scored highlight reel goals including one from Miele while he was prone on the ice after being crosschecked from behind. The Crying Irish stuck to their routine of running Reichard as I counted at least four times the Miami netminder was knocked to the ice including once where his helmet was taken off his head. Unlike February’s 5-5 tie, however, Reichard would not be rattled and he maintained his stellar play of the past several weeks. On the other hand, Mike Johnson proved unworthy as Miami torched him for six goals before he was pulled midway through the third period. Alden Hirschfeld and Bryon Paulazzo chipped in with goals and Reilly Smith added three assists to round out the bulk of the Miami scoring. It was the freshman Paulazzo’s second career goal. The RedHawks await the winner of tonight’s WMU/Michigan game which starts at 8pm EST and can be seen on FS Detroit + in tomorrow’s championship game. With another four point game, Andy Miele now has 23-46-69 on the year. Can you say Hobey Baker? Carter Camper has a career best 19-36-54 good enough for third in the nation. With three assists, super sophomore Reilly Smith now has 26-25-51. Miami now has three players with more than 50 points on the season. >Detroit, Mich. – For the second consecutive year, a Miami RedHawk has won the CCHA’s Player of the Year award. Last season, then sophomore Cody Reichard led Miami to a runaway CCHA regular season championship. 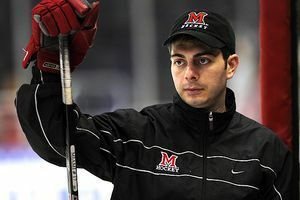 This year, Detroit native and Miami senior assistant captain, Andy Miele pulled off his own sort of runaway. Miele led the nation in scoring as he torched the NCAA for 21-44-65 and counting. Miele’s points total was the highest for a CCHA scoring champion since 1991-92 and he is the only scoring champion in CCHA history to have had more assists than anyone had points. Senior captain Carter Camper won Miami’s first ever CCHA Scholar Athlete Award as he also had an outstanding final season in red and white notching 17-35-52. The native of Rocky River, Ohio, Camper will end his Miami career among the top three scorers in program history. Congratulations to both young men. They are prime examples of what the Miami program stands for both on, and off, the ice. In a stunner, Notre Dame head coach Jeff Jackson was awarded the CCHA’s Coach of the Year honor beating out Michigan’s Red Berenson and much more surprisingly, former Miami assistant and current Western Michigan head coach Jeff Blashill. Blashill has completely reinvigorated a dormant, declining program and gotten them to the CCHA’s Championship Weekend. How Blashill did not win this award is beyond me. Frankly, it’s a disgrace. Oxford, Ohio – Over the past several weeks, there has been a significant push from fans and the SID of the University of North Dakota to promote their one-year wonder, Matt Frattin (32-21-53, 38 games) for the Hobey Baker Award. As you know, Miami has a Hobey Baker candidate of our own, the nation’s leading scorer, senior Andy Miele (20-42-62, 35 games). Much of the misinformation has been directed at one thing, UND’s perceived strength of schedule advantage over Miami. While the Fighting Sioux’s schedule strength is rated fourth by College Hockey News and Miami’s is rated 14th, it’s simply not a big enough discrepancy to matter. If we were talking about Yale’s SOS (42) or Boston College’s (27), then there might be an argument. But, just to even the playing field, I’ve pulled each players statistics in games against teams that finished in the top 6 of the WCHA and CCHA (top 6 since both UND and Miami are in the top 6 so we have 5 league teams to evaluate) and against common opponents. In 19 total games against Denver, Omaha, Duluth, Minnesota and Colorado College plus common opponents St. Cloud, Notre Dame and Maine, Frattin posted 11-9-20. In 18 total games against Northern Michigan, Ferris State, Western Michigan and Michigan plus common opponents St. Cloud, Notre Dame and Maine, Miele posted 12-21-33. Since Notre Dame is a CCHA top 6 opponent as well as a common opponent, we could add New Hampshire to Miele’s resume as another top tier team. If you do that, Miele’s numbers become 12-22-34 in 20 total games. To drill even deeper, what if we take two opponents from each league such as Denver and Omaha, and Michigan and Notre Dame, and break down each player’s performance against the very best of each league? Frattin had 2-2-4 in 6 games and Miele posted 2-12-14 in 6 games. Or, what if we just look at common opponents? Frattin had 7-7-14 in eight games against St. Cloud, Maine and Notre Dame. Miele had 4-9-13 in eight games so that comparison’s about even. So, what we’ve seen is that Frattin has absolutely destroyed the bottom half of his league and lower ranking non-conference opponents racking up huge numbers (33 points) against the likes of Minnesota State, Alaska-Anchorage and poor Michigan Tech with only 20 points against better competition. Consider — with still one more game to play, Frattin has absolutely destroyed Michigan Tech, the 49th ranked team by KRACH of 58 in the NCAA. Frattin’s performance against Michigan Tech has been superb. However, the Huskies are so bad, his stats are being padded against incredibly inferior competition. Remove the games against MTU and Frattin’s line is 27-15-42. And, he would have played the same number of games, 35, as Miele with 20 fewer points. Meanwhile, Andy Miele has performed better against top competition and more evenly distributed his points with 33 against top tier teams and 29 against lower performing teams. Lastly, Miele has been a staple in the community and has built a body of work over the past 3 1/2 seasons. Consider he had 14, 31 and 44 points in his first 2 1/2 seasons (Miele played just half of his freshman season as he enrolled at Miami at the midpoint to help push the ’07-’08 team over the hump) whereas his chief competition had just 15, 25 and 19 points (missed half of last season due to suspension) before putting up 53 in 38 games this year. Further, Frattin had just 4, 13 and 11 goals before coming out of nowhere jumping to 32 this year. Miele has steadily improved and is clearly not a one year wonder as his goal totals have risen from 6 to 15 to 20 and counting this year. Plus, Miele’s stick handling and playmaking ability set him apart from most players in the NCAA. A trait he has demonstrated since he set foot on campus. While the Hobey Baker Award is not a career achievement, past history, behavior and playing your best against your best competition should count and I believe they will. Ladies and gentlemen of the jury, well make that the Hobey Baker selection committee, I rest my case. >Oxford, Ohio – Andy Miele and Reilly Smith scored in a decisive third period as #7 Miami defeated Alaska 4-1 at Steve Cady Arena. Chris Wideman and Patrick Tiesling also scored for the RedHawks who outshot the Nanooks 36-18 in stretching their unbeaten streak to 10 games (7-0-3). After falling behind 1-0 through one period, Miami evened the score on a powerplay goal by Wideman, his third of the year at 5:06 of the second period. Miami dominated the third period as Tiesling, Miele and Smith found the back of the net. Tiesling’s goal would stand as the game-winner, just his second of the year, with assists to freshman Max Cook and senior Justin Vaive at 3:15. Miele and Smith added insurance goals at 11:11 and 17:35 as the big guns got in on the action. For Miele it was his career best 20th goal and 62nd point of the season while Smith tallied his CCHA best 25th marker on the campaign. Junior netminder Cody Reichard surrendered a goal on the first Nanook shot on goal, but shut down Alaska from that point forward to earn the win. Miami goes for the series sweep tomorrow night at 7:05pm at Steve Cady Arena. The game will be televised around Ohio on the Ohio News Network and is also available online via Miami All-Access.